The beautiful art book features Shigenori Soejima’s best work from the various PERSONA games, as well as other projects such as STELLA DEUS and MOMOIRO TAISEN PAIRON, plus an exclusive interview with the artist himself. 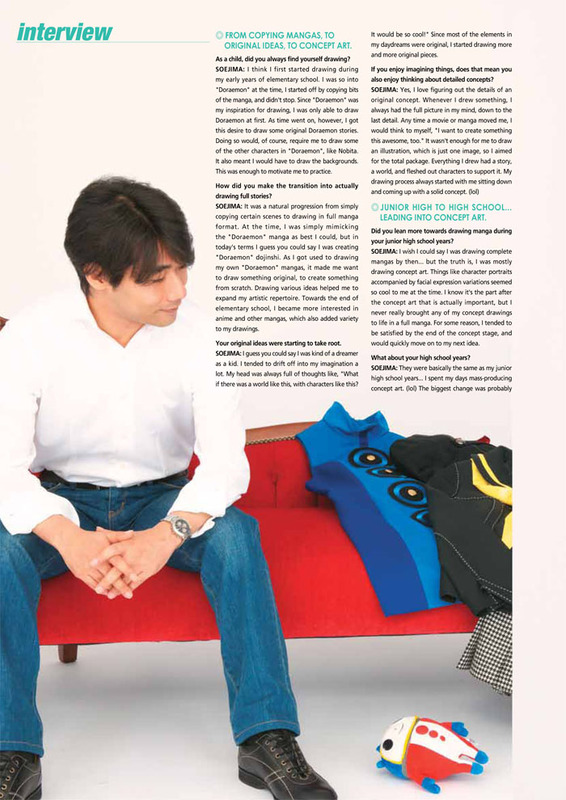 This is a full transcript of the latest Soejima interview, which took place in June of 2010. The interview reveals a more personal side to the artist who garnered a lot of attention as a character designer after his success with “Persona 3”, and traces the path to his latest achievements. FROM COPYING MANGAS, TO ORIGINAL IDEAS, TO CONCEPT ART. As a child, did you always find yourself drawing? SOEJIMA: I think I first started drawing during my early years of elementary school. I was so into “Doraemon” at the time, I started off by copying bits of the manga, and didn’t stop. Since “Doraemon” was my inspiration for drawing, I was only able to draw Doraemon at first. As time went on, however, I got this desire to draw some original Doraemon stories. Doing so would, of course, require me to draw some of the other characters in “Doraemon”, like Nobita. It also meant I would have to draw the backgrounds. This was enough to motivate me to practice. How did you make the transition into actually drawing full stories? SOEJIMA: It was a natural progression from simply copying certain scenes to drawing in full manga format. At the time, I was simply mimicking the “Doraemon” manga as best I could, but in today’s terms I guess you could say I was creating “Doraemon” dojinshi. As I got used to drawing my own “Doraemon” mangas, it made me want to draw something original, to create something from scratch. Drawing various ideas helped me to expand my artistic repertoire. Towards the end of elementary school, I became more interested in anime and other mangas, which also added variety to my drawings. Your original ideas were starting to take root. SOEJIMA: I guess you could say I was kind of a dreamer as a kid. I tended to drift off into my imagination a lot. My head was always full of thoughts like, ‘What if there was a world like this, with characters like this? It would be so cool!” Since most of the elements in my daydreams were original, I started drawing more and more original pieces. If you enjoy imagining things, does that mean you also enjoy thinking about detailed concepts? JUNIOR HIGH TO HIGH SCHOOL… LEADING INTO CONCEPT ART. Did you lean more towards drawing manga dung your junior high school years? SOEJIMA: I wish I could say I was drawing complete mangas by then… but the truth is, I was mostly drawing concept art. Things like character portraits accompanied by facial expression variations seemed so cool to me at the time. I know it’s the part after the concept art that is actually important, but I never really brought any of my concept drawings to life in a full manga. For some reason, I tended to be satisfied by the end of the concept stage, and would quickly move on to my fled idea. What about your high school years? the fact that I started coloring my illustrations once I hit high school. What kind of tools were you using back then? SOEJIMA: I used a lot of Acryla Gouache. I had an infatuation with artistic tools and materials back then, so I’d find out what professionals were using, and would buy the same things. Kent paper illustration boards and Copic markers were also quite popular When I was in junior high school, I was constantly drawing just for the fun of it. It was only during my high school years that I realized I would actually have to study the art in order to improve, and really began to take it all seriously. GETTING THE IMAGE ON THE PAPER CLOSER TO THE ONE IN HIS MIND. When you speak of studying art, do you mean you took art classes outside of school? SOEJIMA: I was completely self-taught throughout elementary school and junior high school. Once I was in high school, I made the conscious decision to arm for an arts college, and that’s when I first took official lessons in things like sketching. Before you started attending art classes, was there a particular exercise or method you used to practice drawing? Do you think copying mangas was a good training method for you? SOEJIMA: It wasn’t really training, per se. I just copied certain mangas because I liked the artist’s style. It wasn’t just about copying the characters out of the book, though I was trying to absorb the artist’s distinct style, or essence. I guess it was a child’s attempt at comprehending and acquiring a visual style. THE PEARLS OF WISDOM (?) OFFERED BY HIS ONE ATTEMPT AT DOJIN WORK. High school is generally when students start thinking about their future and the paths they hope to take. What sorts of plans did you have for yourself back then? SOEJIMA: For elementary school and junior high school, both of my graduation [ed. note: ‘gradutation’ in the original text] papers clearly stated that my dream was to become a manga artist. Once I became a high school student, however, I gained a more realistic view of the world and my own skills. It didn’t take long for me to come to terms with the fact that becoming a successful professional manga artist would be nearly impossible for me, so I did start considering alternatives. During that time, did you try you hand at dojinshis or going around to publishing companies to show them your work? SOEJIMA: I was very excited about it but it totally bombed. (lol) We were unknown amateurs with little skill to speak of, and we suddenly put out a book full of original pieces. What did we really expect? I submitted an original 16-page fantasy manga for my portion, but I got so into introducting this epic world of mine that I didn’t get around telling the actual story. Anyone who knows anything about the manga industry would know better than to do that (lol) We printed a hundred copies, and managed to sell two. FIGURING OUT WHAT HE WANTED TO DO… THE PATH TO ATLUS. How and when did you make the conscious decision that you wanted to make a living as a professional illustrator? Tell us about your days In the design academy. SOEJIMA: I drew a lot. I also went to my local arcade almost every day. At the time, I was really into “Gouketsuji no Ichizoku (Power Instinct)”, “Samurai Spirits (Samurai Showdown)”, and “Street Fighter II”. Once you graduated from the design academy, you were a full-fledged member of society. This must be where Atlus came in. SOEJIMA: Actually, I almost joined an advertising agency immediately after graduating from school. I had been recommended for the position while I was still attending school, so I was quite confident that my future was secured. When that offer went up in smoke, I admit I did panic a bit. I was suddenly left to look for a job on my own. Though that might have seemed quite unfortunate for you at the time, I think the rest of the world agrees that it was a stroke of luck for the gaming industry. So then Atlus was one of the companies you applied to in your job search frenzy? SOEJIMA: Atlus was among my “first choice” group of companies, yes. What other industries did you apply to during that time? SOEJIMA: All of the companies I applied to were within the gaming industry, actually. I always loved games and their characters as a kid, but I thought I would have to keep that in my life as a hobby rather than a career. That’s why I was ready to accept that job at the advertising agency. I thought a job as an ad designer was the most realistic career for someone like me. I think the shock of losing that potential job gave me the push I needed to pursue my passion as a career. As you know, I had spent most of my early years mass producing concept art and playing fighting games, so it was clear to me that my dream job would have something to do with creating characters for video games. What companies did you apply to other than Atlus? SOEJIMA: I certainly applied to a lot of places, since job searching is as much a numbers game as it is anything else. Some of the companies I applied back then no longer exist. A fork in the road of life. What was it about Atlus that made you pick them above all the other companies you had applied to? When you were considering potential jobs, were any of the positions unrelated to drawing? SOEJIMA: Since I had been drawing from an early age, it had become a part of my identity. I never considered taking a job that wouldn’t involve drawing. THE NEW GUY WHO WOULD LOOK OVER HIS SUPERIOR’S SHOULDER. Do you remember what it was like to be the new guy at Atlus? Let’s take a moment to look back at all of the projects you’ve been involved with since joining Atlus. I was part of the digital coloring team that colored the demons for this project. I had wanted to be part of this project ever since I joined Atlus, so I was delighted to receive this assignment. It had been decided early on that the demons would be cel shaded, but Atlus did not have any tablets at the time. It was hard enough to color using a mouse, but one of the demons I had been assigned was the Metatron, and that involved a lot of shiny metallic surfaces. I determined that it would be far easier to give the Metatron a more photo-realistic finish using the airbrush tool in photoshop. I did up an example, which was quickly approved, and since then we have colored all of the demons with the airbrush tool. I was in charge of the base art and designing the sub characters. Drawing characters had always been my dream, so I was really happy to get this assignment. I was also granted the opportunity to have some involvement in the concept side of things, so I put a lot of thought and detail into the mechas of the Spookies trailer house. Kaneko was responsible for the design of the main characters of this game, but I did the main characters’ bust-up portraits that you see in-game. I considered this a very special opportunity, as Kaneko had personally asked me if I was interested in giving It a shot. Of course, I responded with an immediate and enthusiastic, “Yes! !” Once I actually got into it, however, I soon realized how difficult it was to draw the characters so that they looked exactly like Kaneko’s illustrations. Another duty I had in the “Soul Hackers’ protect was the item graphics. ‘Soul Hackers” was the first title where we had visual representations of the items that had thus far been depicted only in test As a result, I was also asked to do the item graphics for “Rebus”. I handled the base art and the sub characters, just as I did for “Soul Hackers”. Aside from those, I got to work on some of the settings, like the exterior of the school, other buildings, and mochas, I also had a hand in the concept behind the main character’s bike. These three titles were pretty much just remakes for the PlayStation console, so most of the development was contracted out. My job was to check all of the work as the Atlus representative, and I made sure I was all over that. This was the first time I performed this sort of task, and it was also my first time working with people outside of Atlus, so it was definitely a learning experience. For “Nocturne”, we switched to 3D models for the characters, so there wasn’t a whole lot of drawing going on. I worked on a portion of event production, as well as the visual aspects of the world concept, including things like the positioning of boss characters. I also edited the looping sequences, so I think it’s safe to say that took on a variety of new challenges during this project. It was around this time that I started thinking a bit more about my future and what I could offer. I had been hearing rumors that the division which mostly work works in conjunction with external contractors was about to begin development on a new game called “Stella Deus”. So when the development director came around our neck of the woods and asked me if we had an available illustrator on our team, I shamelessly plugged myself for the job. This was my first opportunity to be in charge of the main character as well as the art direction. Needless to say, my mind quickly filled up with all kinds of exciting ideas. The biggest problem I faced was the fact that I hadn’t yet refined what could be considered as “my style.” At first I was at a loss, but I eventually decided that the best way to go would be for me to start by figuring out what I thought was the best visual balance. By going back to the artistic style from my days of drawing lust for the fun of it, I finally settled into the style you see today. So my memories of “Stella Deus” have more to do with my drawing style dilemma than the actual process of character design. Drawing illustrations for a novel has a different appeal from drawing illustrations for a game. A part of me has always dreamed of illustrating for a novel, and that coupled with the fact that the offer came from a noteworthy publication like ‘Faust” made this a very exciting opportunity for me. 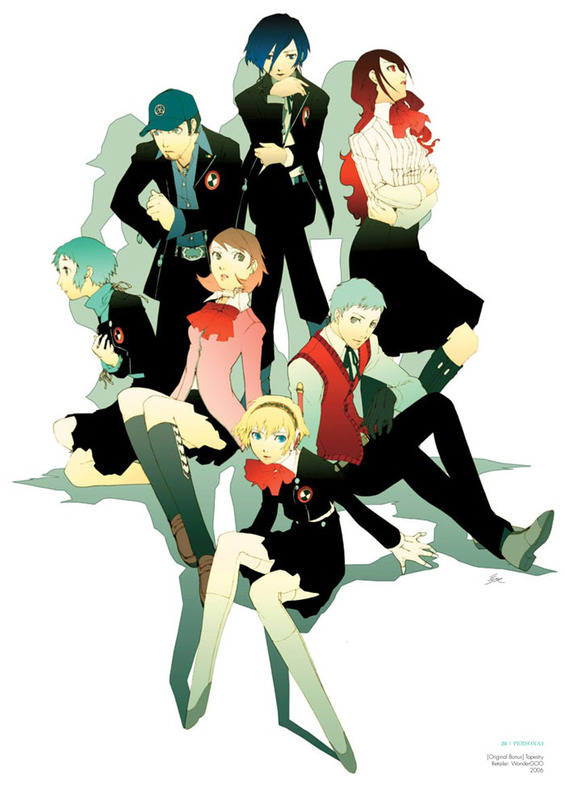 I definitely felt a lot of pressure when working on “Persona 3”, as the series had already established a passionate following for itself, and we wanted to make sure we didn’t disappoint the players. The goal was to ensure that the players of the “Megami Tensei” series could be proud that they chose to support the series. With this in mind, I had to reassess my art work and how it would fit into the game. I spent a lot of time on the interface and the opening movie, hoping that the player could say to themselves, “Yep I’m playing a really cool game.” The hardest part of working on ‘Persona 3″ was the fact that I was in charge of art direction as well as character design, which meant the commercial success of the game was something that rested on my shoulders. I had to face tough questions like, ‘What does a designer have to do to ensure the success of a game, This project really forced me to think about how the visual and design aspects of a game affect the overall appeal. I designed the new character, Metis. We were very fortunate to receive a positive reaction to “Persona 3”, and that led to us developing this add-on. The whole notion of getting another opportunity to draw characters by pleasing the players was very satisfying to me as a character designer. I was tasked with the base character designs for this project. Doing base designs involves preparing things like facial expressions, costumes, and anything else that would be referenced when creating the concept art. It’s pretty much the same as normal character design, except that an anime designer would come in after and adjust my drawings to fit better with the other characters. 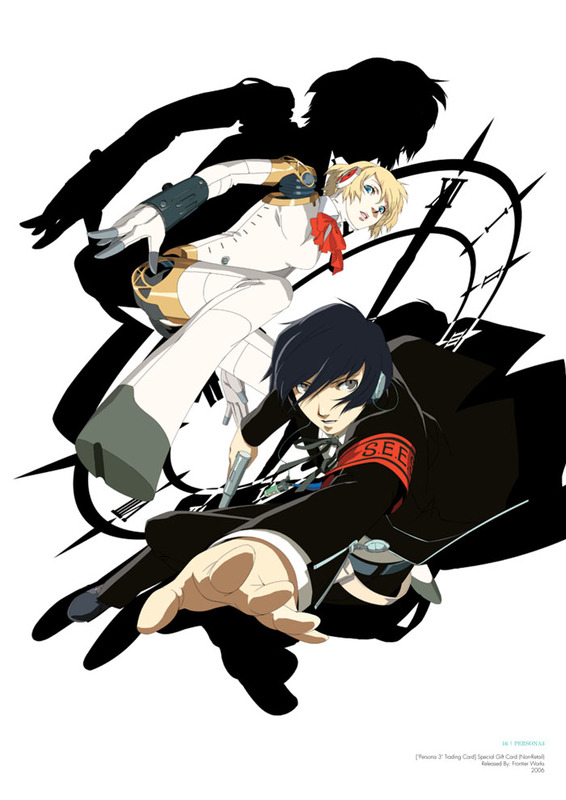 My role was the same as with “Persona 3”, character design and art direction. Since “Persona 3 FES” was an add-on to “Persona 3”, we already had a foundation to build off of. With “Persona 4” we basically had to start all over again, and figure out how to capture a freshness that would not only match “Persona 3”, but hopefully surpass it. We had to make sure the gameplay system in “P4” was an improvement compared to “P3”, and on top of that, we knew the players would be expecting something more from the art and story. In this way, “P4” offered a whole new set of challenges. I designed the female main character who made her first appearance in “P3P”. This was the first time I had ever designed a female lead character, and it turned out to be more challenging than I ever could have imagined. The “Persona” series has its fair share of female fans, and as such I knew it would be important for the female lead to appeal to the female players as well as the male players. I spent a lot of time gathering information to that end, and I think it was a great learning experience for me. You were responsible for the concepts behind the main characters for “Stella Deus”, “P3” and “P4”. What were the major differences as far as character design was concerned? SOEJIMA: Well, each title had its own distinct concept, and that certainly spilled over into the character designs. Can you elaborate on these differences for us? 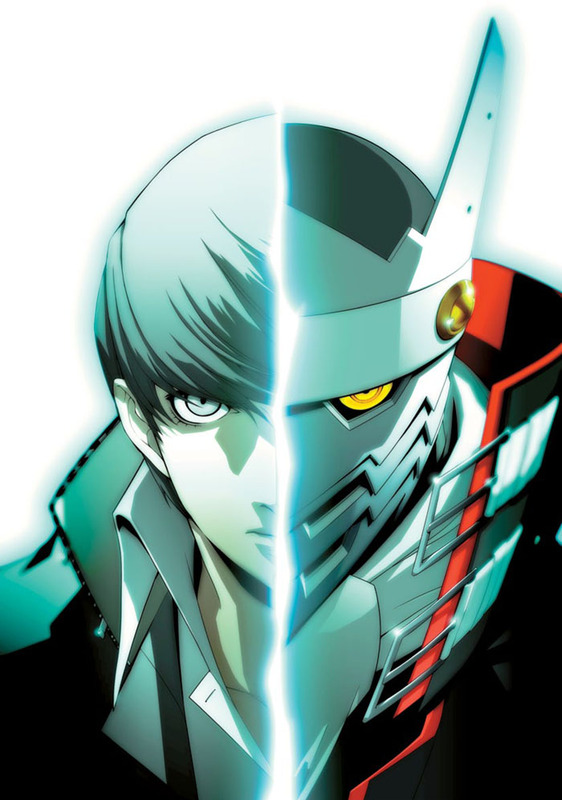 SOEJIMA: If we were to take “P3” and “P4” as examples, “P3” had more of a fantastical manga type feel to it. It had a battling mecha in the form of Aigis, and the student council president Mitsuru attended school with a bold hairstyle and boots that went up to her knees. “P4” on the other hand, was set in a rural area, and was quite limited to the geographical space it explored. As a result, the external appearances and overall designs of the cast were more realistic. For any title, the most important thing is to stick to the main concept. We set up boundaries for each project, and if we don’t stay within those guidelines, the whole thing can become unbalanced. What was the design concept behind ” Stella Deus”? SOEJIMA: The world itself was our main focus for “Stella Deus”. We had to first figure out what the “Stella Deus brand of fantasy” was, then we built our concept around that. 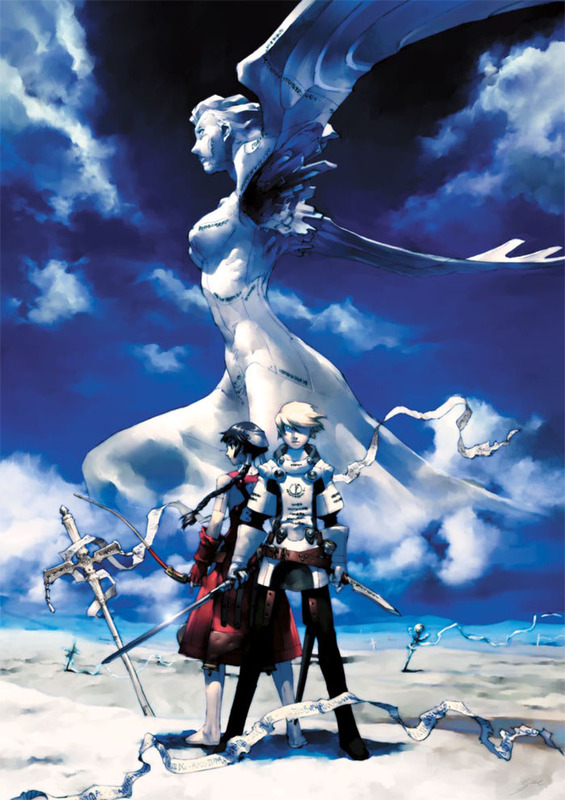 We didn’t want “Stella Deus” to be a simple collection of the usual “fantasy genre staples.” Since this world was basically one giant desert, it was important to fill it with new ideas that would catch the players’ interest. The first thing that comes to my mind when I think “fantasy” is the traditional suit of metal armor, but I think we all know what would happen to anyone who tried to wear something like that out in a desert environment. So an intentional lack of metal armor became our first rule. Next we considered the cultural background as far as the swords in the game would be concerned; forging or casting? By hammering out the little details, we eventually shaped the overall concept of the world, which in turn guided us through the rest of the design process. Despite being “fantasy,” the realism offered by an imaginary world is what makes it more appealing. Did you approach the actual drawing process differently for each of these three tides? SOEJIMA: I wanted to give the art of “Stella Deus” some depth and flavor since it was a fantasy game, so I mainly used brushes. I started “P3” off with brushes, but I didn’t feel like I was getting result wanted, so I switched to cel shading part way through. (lol) “P4” was cel shaded from start to finish. THE DIFFERENCE BETWEEN “P3” AND “P4”, FROM A COLORING PERSPECTIVE. SOEJIMA: With P P4″, I intentionally changed the coloring style to prevent the game from taking on a “animeish” look. There are certainly lots of anime fans out there who would be willing to accept a touch of anime in their games, but there is also a portion of players who will turn away from a title just because it has the label “animeish” attached to it. To dig even deeper, some of those “anti-anime” players are still “pro-manga”, so by shifting to a slightly “mangaish” style, I was able to reach a compromise that wouldn’t alienate any particular player group based on age or gender. I didn’t think about the difference between “animeish” and “mangaish” for “P3”, but I did spend more time contemplating such philosophies for “P4”. Do you think you could explain the difference between anime and mange styles? 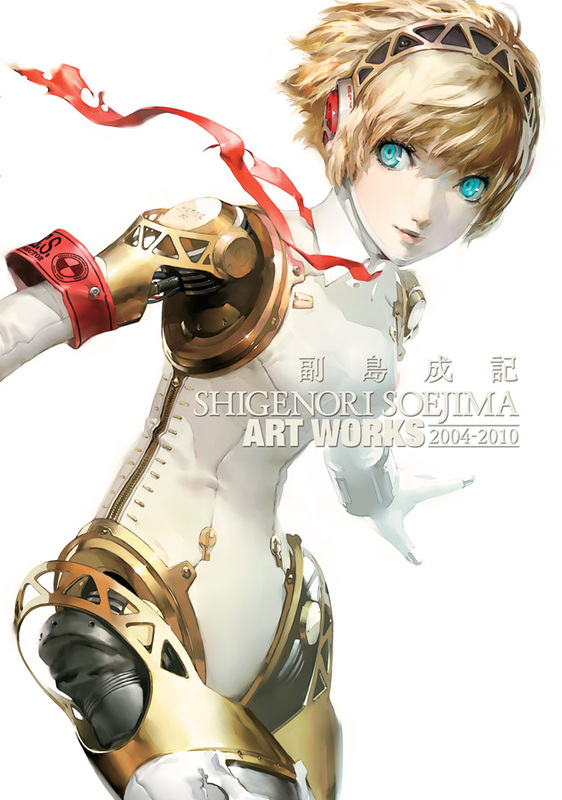 The exclusive portrait of Aigis adorns the cover of this art book, and is also the newest piece contained within its pages. With this illustration as an example, let’s explore the techniques and thought process you apply to your drawings. Please start by telling us why you those Aigis for the cover piece. 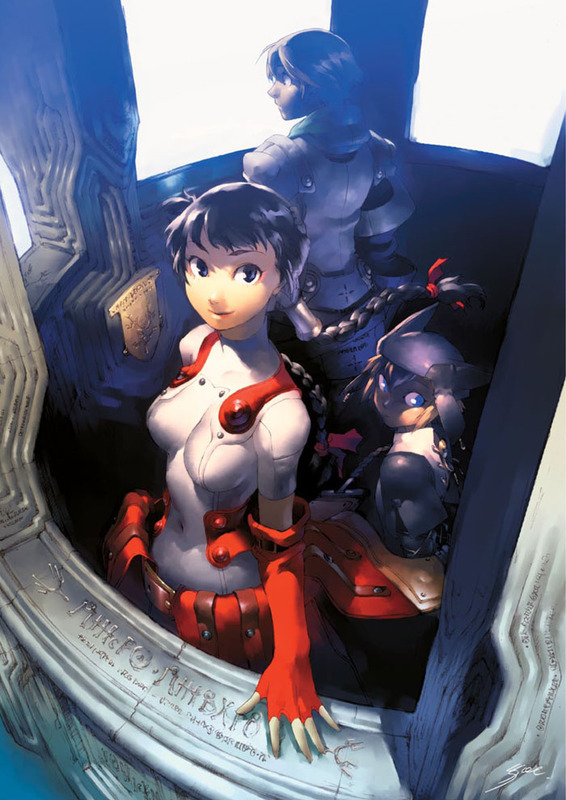 SOEJIMA: I chose Aigis for the cover because I thought she would allow viewers to immediately identify whose art work they would find in this book. Of all the characters I have ever drawn, I think its safe to say that Aigis is the most well known, and most readily identifiable character. I suppose i could have used a main character from “P3” or “P4” as well, but Aigis has always been a special character to me, especially with regards to her level of design. I also have some strong memories associated with Aigis, as I struggled quite a bit with the notion of drawing a mecha in my style. When you say, “her level of design,” what are you referring to, exactly? SOEJIMA: I guess I mean the amount of imagination that her design is composed of. For characters like Yukiko from “P4”, there is a certain amount of realism that I was signing for. As such the questions surrounding Yukiko’s design were things like, “Should we put a hairband on her?” or “Maybe she would look better with a cardigan?” or “How should I shape her silhouette?” Due to the restrictions of the general direction of the games in the series, Aigis was probably the only character whose design granted me an unprecedented level of freedom and imagination. THE SIGNIFICANCE AND THEME BEHIND THE ILLUSTRATION THAT WAS NEVER MEANT TO SEE THE LIGHT OF DAY. What was the theme for this illustration? The piece tamped out beautifully! SOEJIMA: Thank you kindly. To tell you the truth, I started drawing this piece before talks of an an book even began It was something I was working on just for fun, and I never expected it to see die light of day. What inspired you to draw this piece? the purpose of the cover. It was a tough choice to make, but I knew in my heart that this portrait of Aigis best represented the spirit of this art book. When did you first start drawing this piece? You specifically mentioned the hair… was the hair an important part of this piece? SOEJIMA: The level of detail in the hair and mechanical parts was something that I wanted to showcase through this piece, yes. All of the Aigis illustration I’ve done up to this point have had to be altered to better suit the anime. By removing all of those external constraints from the picture, I was able to draw Aigis however I wanted, with as much detail as I wanted. This illustration represents the most faithful reproduction of the Aigis that I had originally imagined. The details that were made possible by this level of freedom were things like the way the hair grows out, the color of the hair being a unique shade of gold, the skin tone, and the quality of each distinct part. Also, since this illustration was intended specifically for my own personal art book, I was able to disregard the “official” character details. I hope the readers will find the little discrepancies interesting, like the structure of the shoulder and the machine gun. HIS POLICIES AS A CHARACTER DESIGNER AND ILLUSTRATOR. You are both a character designer as well as an illustrator. Do you have any particular policies that you follow with regards to these two related yet dialect professions? SOEJIMA: Well, as far as character designs are concerned… I try to come up with character designs that me easy to understand. For example, put Chie from “P4” in a jogging suit, because it is a common stereotype for rural students to be dressed this way. But it also gave the usually bland jogging suit a more fashionable appearance by using vivid colors, in order to make it fit in with the general modern vibe of the game, and to make it that much more memorable. I guess you could say an ideal character design for me would take design essences that anyone can relate to, and combine them into something fresh and new. Why is it so important to you that your character designs are easy to understand? SOEJIMA: I guess I want to feet that empathy or connection with the people who look at my designs. I want the viewer to be able to “get” the character upon first glance, and understand what t was trying to convey with their design. All of the characters you have designed seem to exude a kind of purity, a refined grace… Was this intentional? SOEJIMA: I suppose you could say that. I think my personal preferences and opinions have a lot to do with this. Whenever I am designing a character, I am careful not to make it vulgar. It’s not that I have anything against vulgarity, and in fact I dare say I quite like my fair share of it, but I just want my characters to give off a reassuring vibe. I do have a desire to try my hand a project of varying flavor, and I’d love it if I came out with something that made the consumer say, “Is he allowed to do something like this with his style! ?” Despite infusing my character designs with reassurance, I still want to keep my overall style very flexible. Nothing would please me more than to have our projects appreciated by a wider audience, regardless of age or gender… though I understand how it may be difficult for us to get senior citizens on our bandwagon. (lol) Another consideration that I feel is very important is the notion of designing characters that will be liked by players of the same gender. Even in real life, I think people who are well-liked by members of the same gender have this powerful innate appeal that also makes them more attractive to members of the opposite gender. Therefore, according to this theory of mine, if I manage to design a character that appeals to players of the same gender, it is almost guaranteed that they will be liked by all players, regardless of gender. Do you have any similar policies as an illustrator? SOEJIMA: As an illustrator, I tend to focus on the ambience. I use the background to create a certain vibe, whether it is dark, fun, or something else entirely. On the other hand, if the purpose of an illustration is to showcase the design aspects, then the design itself would carry the vibe I’m trying to convey, so it becomes less important to have a dearly defined background. Other than that, also take into consideration the end use of the illustration, and the role it is expected to play. To wrap up this interview, please tell us about your plans for the future. Do you have any particular goals or ambitions as far as games are concerned? SOEJIMA: I love military stuff and sci-fi, so I’d love an opportunity to design a world for a game like that, from the ground up. That sounds like an “eating project waiting to happen! What else? I’d be very interested to see your take on a galactic battleship. (lol) Do you have any plans outside of the gaming industry? SOEJIMA: I currently have this intense desire to do my own original manga, but I’ve never actually completed anything that might even loosely be considered a manga. (lol) I’m probably just not suited for a project like that but l think I could gain something valuable from seeing it through to the end. I think I want to drew a manga because l see it as a challenge as as well as a way to satiate my curiosity about the whole process. Manga is like a composite art form that you can shape to your personal liking. What is it like to perform every step by yourself? Would I ever be able to do all of that? If I want to favor the answers to these questions, I’ll have to actually give it a shot. Would it be an entirely new and original creation, or would you use characters that you have previously created? Sounds like you have it all planned out (lol) So would it be safe for us fans of your work to assume that this project is already underway? SOEJIMA: I do have a notebook that is actually labeled “Full Color 36 Pages”, but its still blank as of now. (lol) l know it sounds like a big joke, but I’m quite serious about it. Drawing a manga something that I’d like to do… some day… maybe soon. Thank you for taking the time to talk to us. Your comments were both insightful and entertaining. We look forward to seeing your finished manga, and I’m sure we’ll be back for another interview when your next art book is published.